Recently, our team attended Exhibitor 2017, a conference for trade show and corporate event marketers, in Las Vegas. Companies from all around the globe attend this conference to show off their creative work and developments. We attend the conference to stay informed about the latest innovations and trends in the industry as part of our goal to best serve our clients tradeshow and display needs. We put this brief together to share a few items we saw you may want to know about. This SEG Fabric Pop-up system offers some really unique features. It combines the light weight of a seamless fabric pop-up frame with the wrinkle free smoothness of an SEG accepting extrusion. The product is easy to ship (like pop-ups) and straight forward to setup. 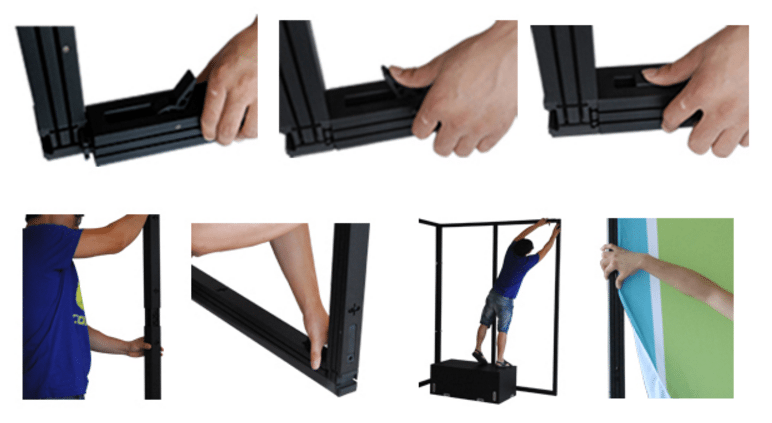 Like most pop-ups, the fully deployed frame stands on its own and does not require any other support (although feet are available for stabilizing in high traffic areas). So if it is so much like a pop-up what’s the point? A big concern with fabric pop-ups is that after long storage periods the fabric graphic develops wrinkles. SEG fabric extrusion strategies stretch the fabric enough to eliminate wrinkles. So this system will allow your graphics to look better and more professional. Here’s the next unexpected feature – the individual wall sections can be connected end to end and/or stacked like building blocks. When combined, they hold together with small easy to use brackets. 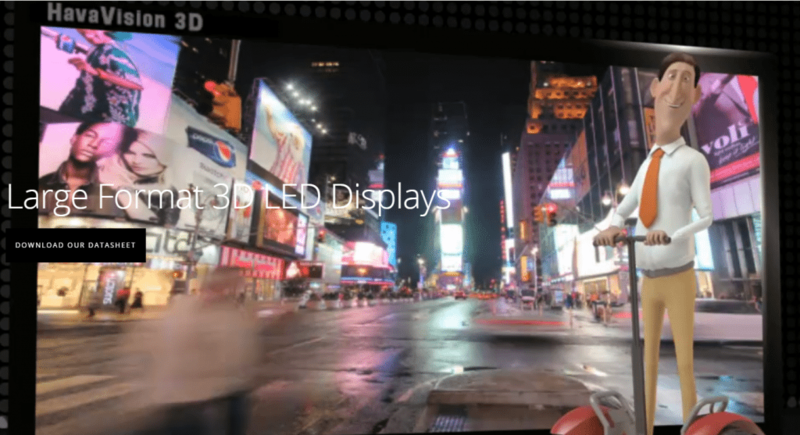 These displays can be combined to make really big structures (see images below). The structures can be backlit. So not only can you create huge light weight graphic walls, they can also be huge light weight BACKLIT graphic walls! The lighting system is based on LED ladder lights. They provide bright even lighting side to side, top to bottom. Next on the list is a new plastic light box display. The designer’s goal was to create a man-sized, self-supporting, inexpensive, light-weight, portable, backlit graphic display. 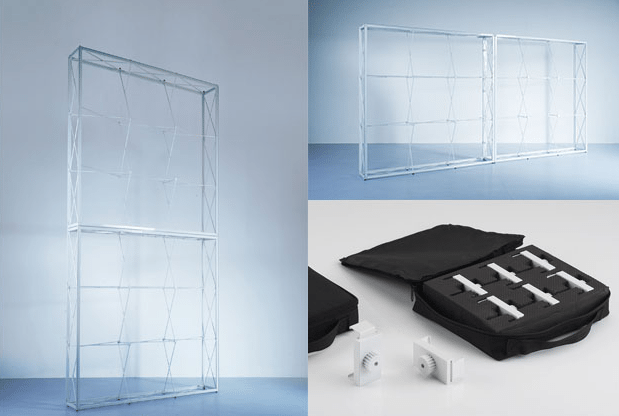 13 individual plastic pieces snap together (no tools) to form a 1 meter width, by 2 meter height, fabric SEG accepting frame. To backlight the frame, you snap in 6 side light modules. Power supplies are built in to each light and the modules daisy-chain together with patch cords so a single cord plugs them all in. They offer three different kits to meet your needs. The first kit, least expensive, is a simple panel and offers no lighting option. The second kit is a panel that includes 2 LED Side Light modules. The third kit has 8 LED Side Light modules for “perfect illumination” (a lot brighter than #2). Each kit includes feet, comes in a well-designed, re-usable box, is highly portable and lightweight, and, because plastic costs less than aluminum, is reasonably priced. 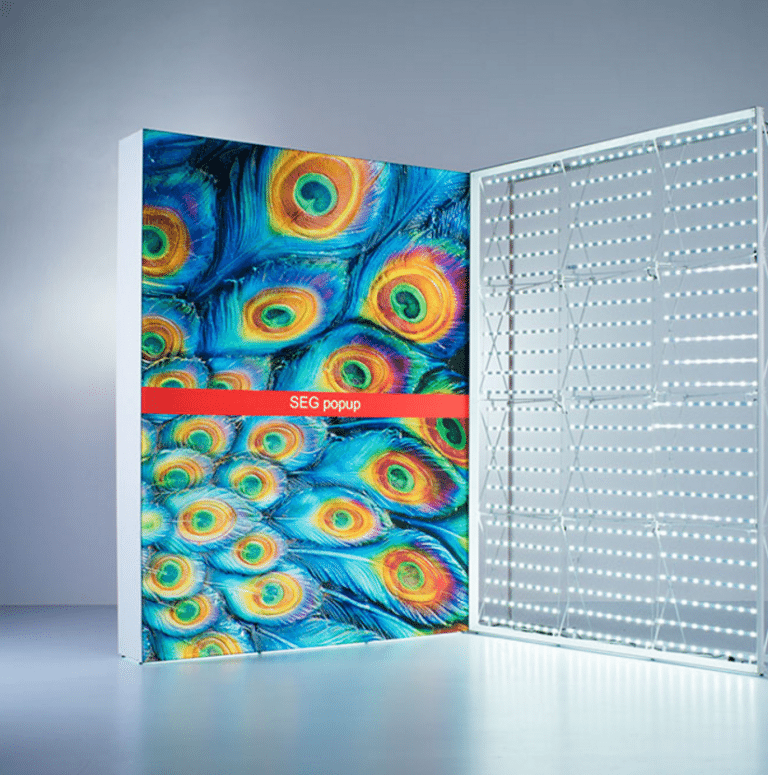 This is a great way to add a human sized light box to any portable exhibit. And by the way, for the price of a 2nd graphic they are double sided. We’re very interested in these, please let us know if you agree. Charging tables are becoming popular on trade show floors. They invite attention and provide a restful oasis for prospects and their phones. One of our top vendors now offers a variety of contemporary designs, including bistro, coffee, and end tables in round, square, and custom shapes. These attractive solutions come with USB charging ports and internal pre-configured wiring for easy assembly. You can customize your charging solution with distinctive graphics, unique colors, and LED lights, both white and programmable RGB. They also are available as rentals. This is a plastic extrusion based system the manufacturer called their “slide and lock” modular system. Slide and lock? It sounds simple, and it was. We were quite impressed with how well it worked. It allows you to have an SEG fabric backwall with shelves, a rare commodity. Booths setup easily and do not require tools. 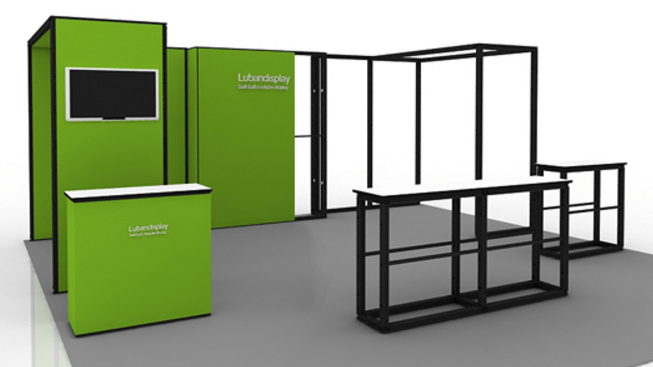 You slide the pieces together and snap the locks in place, then assembled panels snap together and create your booth. 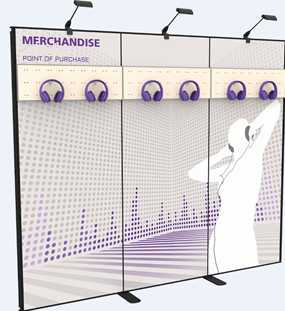 While the system lacks the simplicity of pop-up booths, it is definitely a well-designed, light weight portable system, and we think the benefit of displaying merchandise with an SEG fabric graphic backwall makes it worth it. Being modular, there are many layouts to choose from. It’s convenient and customizable with an endless number of possibilities. 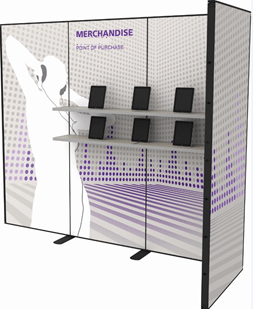 Whether you want to put together a small booth, or a large exhibit, this SEG Fabric system will do the trick. There was a second option for backwalls that will support shelves. This one relies on tube frames and fabric pillowcase type graphics like our Curves Light series. This adjustable shelf strategy with fabric background will give dimension and flair to any light weight merchandise selection. These guys were just plain fun. Air Stage has worked with Disney, Cirque Du Soleil, the London 2012 Olympics, and more. They produce some of the most magnificent in-door flying creations imaginable. When they say, “You imagine it – we make it fly,” they aren’t kidding. Seeing one fly in-person took everything we had not to try and grab the hand held remote control and start chasing someone. Highly detailed and controlled by onboard fans, Air Stage’s dirigibles will captivate any audience and make your brand stand out whether it’s Beer or Cars or Fish or whatever. 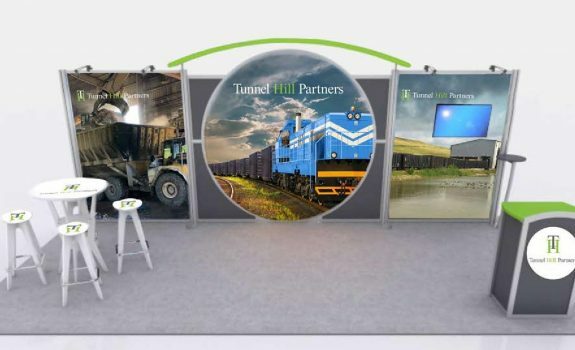 While these aren’t something everyone needs for their booth, it certainly is fun to see what can happen when technology and 3 dimensional graphics come together. You can checkout their website here. For anyone who’s a fan of 3D, like Bill, you’ve watched 3D technology get better year after year. 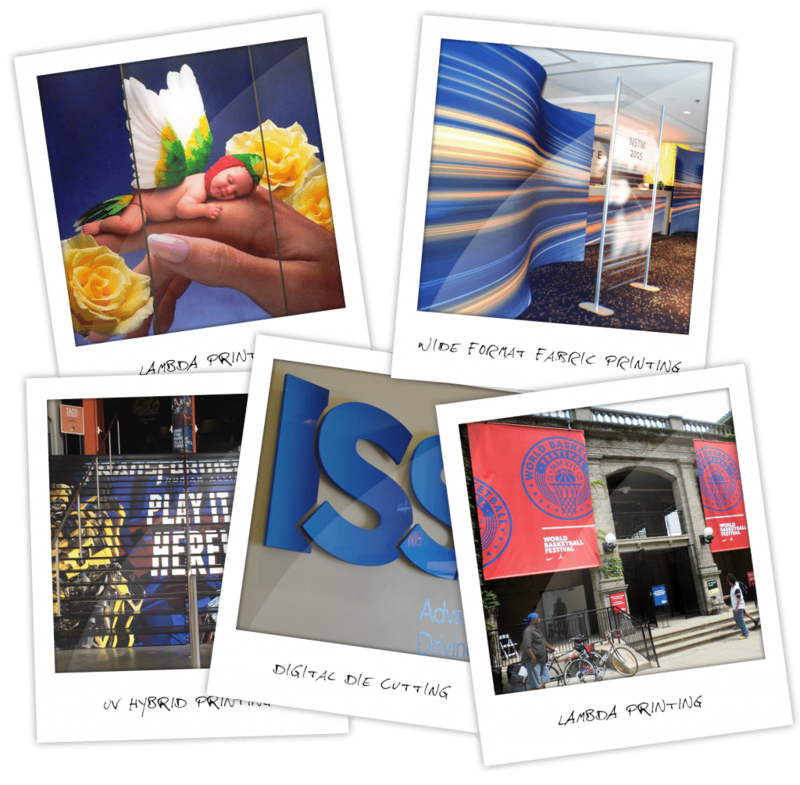 For now, Haverford Systems has the best out there for trade show environments! At the expo, they featured their new 20’x8′ 3D LED wall with crisp, smooth animations that did not strain our eyes or our stomachs. Viewers wore polarized lens glasses (similar to those currently used in movie theaters) and saw 160 square feet of high definition motion graphics with 15 ft or so of depth (2400 cubic feet?). It was a jaw dropping WOW to say the least. They rent the walls, have canned content, and also have the ability to customize or create new content. You can view their work here. The Exhibitor Show 2017 show was a good experience. As a show, overall, there was far less emphasis on portables and more on custom builts and services than past shows. But as always, what WAS there demonstrated great innovation and beautiful leading edge design. We’re already looking forward to next year’s event! All Benchmark Wants for Christmas is a New Printer! Thank you on behalf of the graphic designers at the Chicago History Museum for your integral part in bringing our graphics to life for the Abraham and Juárez exhibits. We couldn’t have done it with out you!